We trust our schools with the safety of our children every day – but what about when teachers go on strike? Surely there should be a law that ensures that at least the essential staff are in place so that our children are supervised and their safety is never put at risk? In addition to writing an open letter to the president, we asked the Essential Services Committee (ESC) to investigate (they have the power to limit strike action). The nutrition and health needs of learners must not be compromised. Our full submission can be found here. 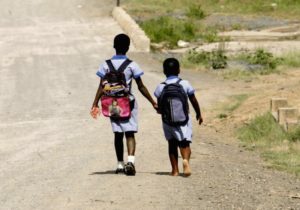 Visit protectourchildren.co.za to co-sign our letter to President Ramaphosa requesting that the national ministers of Basic Education, Police, Social Development and Justice take action, step up, and protect our children. Attend a hearing by the Essential Services Committee (ESC) and support our call to make sure our children are supervised at school during strikes. Whether you’re a parent, a teacher or a member of a school community, please contribute to this process so that we can ensure our children are protected. Give your full contact details (physical and postal address, email address, telephone numbers). Contact Beverly Ramoncha at the Essential Services Committee (BeverlyR@CCMA.org.za). The Manifesto for Change is our contract with South Africa should we be entrusted to govern.